The Waite-Colman Smith is probably one of the most famous decks in the world, printed in many different era's versions and editions since it first saw the light in 1909, but very few people know Arthur Edward Waite also created an other deck this time with the artists John Trinick and Wilfrid Pippet, all images from that deck are now published in a limited edition book by Marcus Katz and Tali Goodwin and available here. Subtitled "A Christian Mystical Tarot (1917-1923)" where to be used in Waite's own mystical order the 'Fellowship of the Rosy Cross' in rituals as meditations on the 22 paths of the Tree of Life, correspondences who differer significantly from the 'Hermetic Order of the Golden Dawn' ones. The following details come from the publishers page: "80 colour and b&w plates, extensive commentary and biographies, with a preface by Mary K. Greer. 250 copies only limited edition (186pp, hardback, dustcover). In this book you will be introduced to these mystical and sublime images, and given ways of using them for your own contemplation in an ancient technique termed "Lectio Divina". 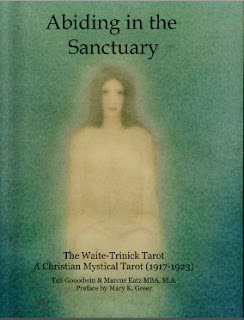 You will be shown how they correspond to the Tree of Life and discover Waite's hidden mystical system for spiritual development illustrated by the Tarot.The book contains original sketches and paintings by J. B. Trinick, forgotten for over thirty years in the British Museum, a full set of the b&w plates produced from the images, in addition to extensive research, family background and artistic context for the images." If that doesn't sound mouthwatering to every tarot lover and student. Some tarot pearls are not published as decks but appear as illustrations inside a book, as are these 22 wonderful cards do. They appeared in the French book with the looooong title and subtitle: 'Les 22 Portes - essai pour une approche spirituelle, au seuil du 3ème millénaire, à partir de la symbolique des arcanes de Tarot' (The Doors 22 - an essay for a spiritual approach, at the threshold of the third millennium, to the symbolism and the mysteries of Tarot) published in 2007 by Editions Cosmogone. These big one page sized images follow the TdM tradition (in this case the artist took it's inspiration from the Grimaud deck) but interpreted and redrawn into 22 detailed works of art. I'm back and this time with a new Marseilles deck coming to us from Israel, a country which produces very very few deck (this is only my second deck I know of and own from there).Mister Yoav Ben-Dov, has been a tarot reader and teacher for 32 years, so he knows his tarot. The deck he worked on, aided by 2 professionals, is one of the most popular TdM decks around, to know the Conver deck from 1760, but rather than making a historically correct restoration his version is one for our modern time, for a modern public (with al the advantages and weaknesses that goes with that).The CBD is an artistic remake, bringing the Conver up to date to contemporary printing techniques and visual tastes and sensitivities, what is especially noticeable in the face expressions and the color shades that differ from the original. The artists site, with images of the deck is here and here you can order the deck from him.